A year ago in June 2010, I undertook the first endeavour to quantify the data tsunami that is challenging wireless operators. The Nielsen Company kindly provided again the data to quantify the strength of the data tsunami. So what has happened over the last year? Most carriers introduced changes to their pricing plans. Tiered data pricing has gained traction, with AT&T continuing to offer full-speed tiered pricing, whereas T-Mobile USA has just introduced tiered pricing that includes throttling after the purchased amount of data has been used up. Sprint opted to maintain their unlimited plans but increased the price by $10 per month, and while Verizon was standing pat with its unlimited plan, it announced that this would change by summer – most likely with the introduction of the next generation iPhone. 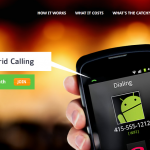 This means that the four nationwide operators have four different approaches to data pricing and consumers. Despite many dissonant voices on the web to the contrary, consumers do not seem to have a distinct preference for any one of them as indicated by the relatively unchanged net subscriber and churn metrics. As the data in the table below shows, the demand for wireless data continues to increase dramatically. Not only has the ownership of smartphones dramatically increased, but usage has increased within every usage percentile by a factor of two or more. Smartphone owners at the 20th Percentile are now using 27 MB of data per month, almost three times more than the 8 MB than they used in 2010, and 479-times more than in 2009 when the 20th Percentile used only 50 KB per month. The median customer (50th Percentile) uses 160 MB in Q1 2011, up more than two-fold from 77 MB in 2010, and eight times more than in 2009 when it was 20 MB per month. We are seeing the most dramatic increases among the heaviest users. Usage at the 90th Percentile increased to almost 1 GB in 2011, up by about a factor of two compared to the 478 MB in 2010, and 4.5 times more than the 222 MB they consumed in 2009. 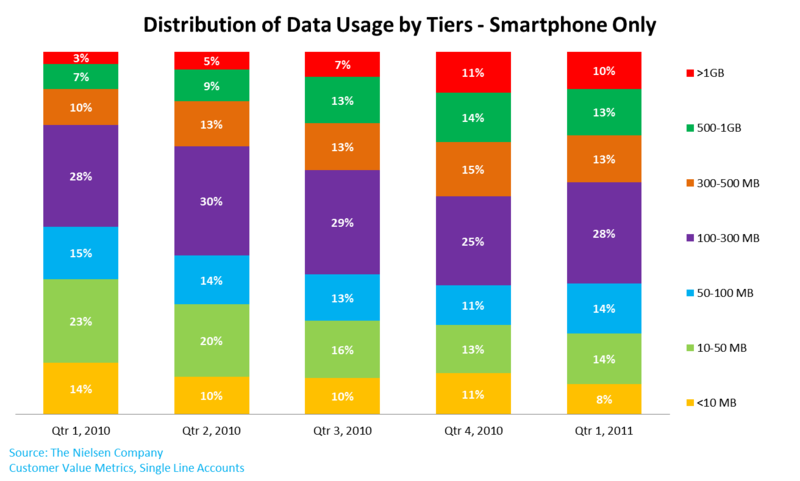 The distribution of total mobile data usage among smartphone owners has also changed. While the new tiered data plans have introduced more fairness to data pricing and usage because low usage customers no longer subsidize high usage customers as they did under the “one size fits all” model; they have not stymied usage or skewed take-up. The iPhone launched with Verizon Wireless in February 2011 with an unlimited plan whereas AT&T continued to offer 200MB and 2GB data packages. Per day sales, in the next 60 days was almost identical for both operators with about 40,000 each. This is even more remarkable as in Q1 2010, the top 5% of bandwidth users consumed 41.9% of all data consumed, whereas a year earlier, the top 5% of bandwidth users consumed 43.6% of bandwidth. What the Exhibit 1 does not show is that this per-subscriber usage increase occurred simultaneous with a huge increase in smart phone ownership, which doubled compared to a year ago, leading to the overall conclusion that total data consumption quadrupled over the last 12 months. While this is a smaller percentage growth rate than in 2009, in the year 2010 the United States consumed more wireless data was than has been consumed since the beginning of this technology in 1999. One of the most interesting factoids from last year’s research note was the fraction of smartphone owners that used only very small amounts of data. 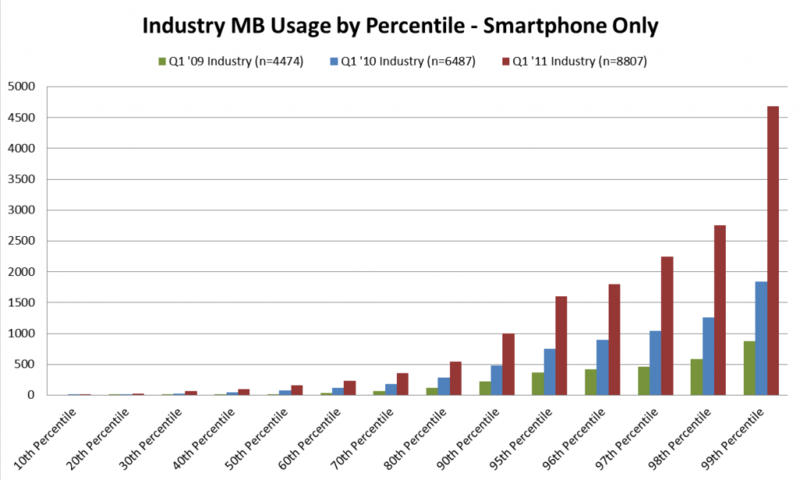 As we can see in Exhibit 2, the percentage of smartphone users that used less than 10MB per month almost halved from 14% in Q1 2010 to 8% in Q1 2011. At the same time, the segment using more than 500MB per month increased from 10% to 23%, while the percentage of smartphone users using less than 50MB declined from 37% to 22%. All the other usage buckets stayed basically the same over the course of the last year. This is particularly remarkable because during this time period the absolute number of smartphone owners more than doubled and we would expect low usage categories to expand as more people are becoming smartphone users. New devices with larger screens, faster processing capabilities, and new video formats optimized for smartphones have made data usage more conducive and seductive and consequently data consumption increased significantly. Is a Sprint/T-Mobile Merger in the Cards?